An unidentified American has defected to North Korea, according to Fox News. A South Korean news reporter was informed by confidential sources that the man said he did not want to be "cannon fodder in the capitalist military" but instead wanted to serve in the North Korean military. There has been a tiny number of defectors to North Korea from the United States. About twenty Americans refused repatriation at the end of the Korean war in 1953. 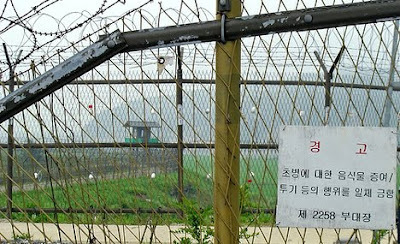 Over the years of tense peace between North and South Korea, there were a few men who crossed the DMZ on foot over to the North Korean side. By contrast, thousands of North Koreans who were prisoners refused repatriation after the 1953 armistice. Most of the defectors from the US army to North Korea were not highly educated. In the propaganda videos and interviews with the 1950's defectors, the anti communist rhetoric of the 1950's was a recurring theme. Some of the defectors who were African American cited racial discrimination in America that was prevalent at the time and their feelings of alienation in the United States. Joe Dresnok, who is the last living American defector in North Korea had just received the news that his wife was divorcing him shortly before he defected back in 1962. Additionally, he was facing a court martial for a night of bar hopping in which he had gone AWOL. Prior to his enlistment in the military, he had been in a series of foster homes. In short, the America that awaited him looked bleak indeed. By contrast, in North Korea, Dresnok had a stable family life and a sort of film stardom The Guardian reports as follows on Dresnok's niche in North Korean life. "But it is Dresnok's extraordinary career swap, from lowly US army private to star of the North Korean silver screen that provides the most surreal twist to his story. For three years from 1978, in a 20-part series called Nameless Heroes, directed by Kim Jong-il, Dresnok played the evil American. Ironically, these roles finally established the defectors' revolutionary credentials, and they were forgiven earlier misdemeanours. "Comrade Kim Jong-il was then in the film industry. He was making movies," Dresnok recalls. "He gave a teaching for us to take part in a film." (Dresnok is the first to admit that he is not an educated man, and that his grammar is sometimes mangled." In a televised interview with CBS, Dresnok does not sound like an ardent political convert but a weary man who found a quiet place to hide from the world. He expressed gratitude to the North Korean government for feeding and housing him at a time when other North Koreans were starving. It is clear that at a time when North Korea's image is suffering that men like Dresnok are a propaganda windfall. Charles Jenkins, another defector was less enthusiastic about his life in North Korea, complaining about privation that still compared favourably to the life of most North Koreans. Jenkins was set up by the North Koreans with a Japanese woman, Hitomi Soga who had actually been kidnapped from Japanese soil by North Korean agents who wanted native speakers of Japanese to train spies in the Japanese language. Although Jenkins and his wife were matched by the North Koreans, they ended up creating their own private understanding in which the regime was distrustfully kept at arm's length. Eventually the admission by the North Korean government that there had been kidnappings paved the way for repatriations, including that of Hitomi Soga. Jenkins remains an expatriate from the US, although not in North Korea. He has bonded to his wife's homeland of Japan and expects to stay there for the rest of his life. The most famous "defector" was Dean Reed. Reed was a pop singer in the 1950s who had made it to the top 40 on a couple of songs but his career never really took off. Several years he spent in South America pushed his politics to the left, leading to his deportation from Argentina. In 1973, he settled in East Germany. After that, his career took off. He became a superstar in the entire East Bloc. His American style, movie star good looks and musical ability fueled his rise on the Russian pop charts. Reed never joined the East German Socialist Unity Party but was doctrinaire in his support of the East German communists. He supported the building of the Berlin Wall and the invasion of Afghanistan. At the same time he professed his fondness for the United States. In 1986, Reed drowned near his home in East Berlin. Suicide was suspected by some, and some in his family talked of murder. Three marriages and reports that his personal life was unhappy at the time of his death provide possible explanations. It is easy to approach defectors and expatriates with anger. After Dean Reed appeared on 60 Minutes, CBS received an unprecedented barrage of angry mail. This is easy to understand. But an in depth look at Dean Reed, Joe Dresnok and others who "crossed over" to the communist side requires a look beyond their statements on politics. Most political and religious conversions do not involve such radical lifestyle and cultural changes as those experienced by America's defectors. The extreme infrequency of Westerners defecting to communist countries contrasts starkly with traffic in the opposite direction. It would be reasonable to suppose that refugees from communism present a markedly different profile. A close examination of the contrast between eastbound westerners and westbound easterners would be a worthwhile study. There exists ample material to undertake it. I hope such a study is undertaken soon.